There are many things start with the /c/ sound. 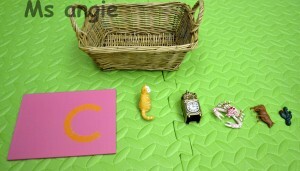 However try to introduce less that 3 objects to the young kid each time, it is easier for them to learn. I let her to explore the objects and the sandpaper letter in the way she likes after the introduction.